The egg is divided into eighteen panels in three tiers, set with sixteen miniatures painted on ivory by the miniaturist Vasilii Zuiev and framed behind rock crystal. The miniatures chronicle fifteen years of Tsar Nicholas II's achievements and elements of the downfall of the Romanov dynasty. The portraits of the tsar, tsarina, their four daughters and their son are framed in rose-cut diamonds on panels of translucent pale pinkish-blue enamel. The names and dates of the birth of the children appearing on the egg are: Olga, 1895, Tatiana, 1897, Marie, 1899, Anastasia, 1901, and Alexei, 1904. Removal of the remains of the saint, Serafim Sarovski. The 15th Anniversary Egg purchased in 1966 by the late Malcolm S. Forbes, editor-in-chief of Forbes Magazine, was his favorite among the fourteen eggs he owned. In 1989 twenty-seven of the original Fabergé eggs were re-united during an exhibition at the San Diego Museum of Art in California. 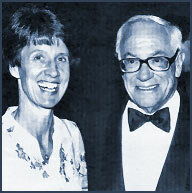 The accompanying photo shows Malcolm Forbes and Christel McCanless during the opening event for the exhibition. The following year, thanks to glasnost and perestroika, the exhibition, Fabergé: The Imperial Eggs traveled to the Soviet Union, and since that time exchange exhibitions are occurring regularly worldwide. photographer, George W. Terrell, Jr.